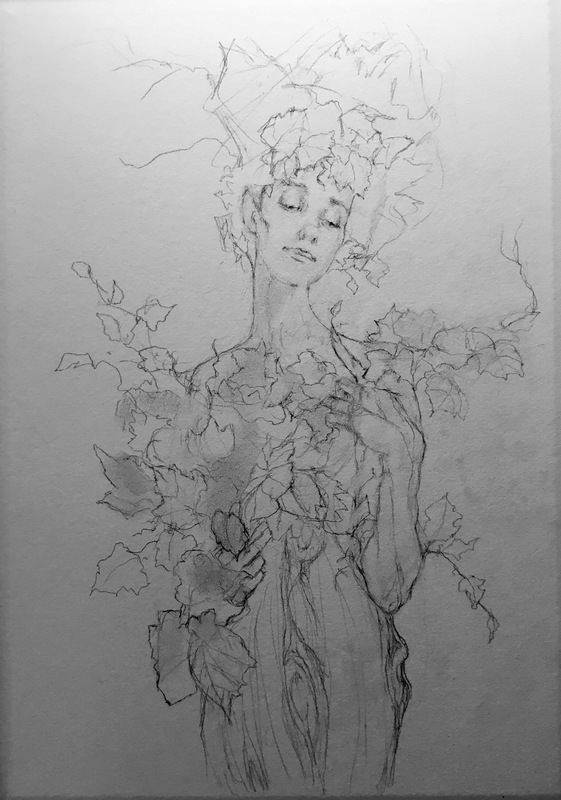 ‘Daphne and Her Tree’– sketch in progress by jada. This is an example of avoiding my book and other main work. Of course, it could, perhaps, become something useful in the end but, really……this is how it came about. Doing research, I was hunting for a specific kind of image i could use from amongst all in my photos . i came across a photo i took of Julia Griffin up at IMC a few years ago (i had asked her to model for my Midsummer’s Night Dream picture). I never got to use the images i took of her for that painting…BUT last night, having come upon it again…the next thing i knew..i started this drawing. Soon to be a watercolor i suspect as i drew on d’Arches paper as it was already stretched (on this fancy stretching gadget i bought but never used)almost as long ago as the photo i took of Julia! !